Financial Reports are found by pointing to Reports and selecting Transactions / Financials. There are several reports, all of which display the information differently based on a variety of search criteria (filters) and display settings available. The Class/Event Revenue Summary report is used to gauge income associated with a specific class or event. The Deposit Slip report is perfect for daily reconciliation. The Fee Summary report allows you to see the current status of fees in a selected Category 1 or with a specific Transaction Type. 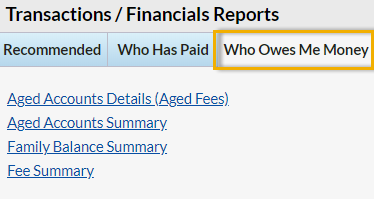 The Paid Fees report is helpful for finding uncategorized revenue or to view taxes paid for the selected date range. 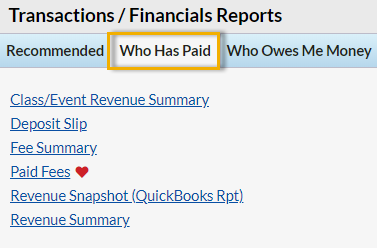 The Revenue Snapshot (QuickBooks Rpt) is beneficial, even without QuickBooks, to see revenue by payment method and Category 1. The Revenue Summary report will show the discounts given within a date range. The Aged Accounts Details (Aged Fees) report is a traditional accounts receivable report. The Aged Accounts Summary can be used to email families with an outstanding balance. The Family Balance Summary helps you supply your accountant with month or year-end balances for each family.